All over the U.S, the price of going solar has been falling dramatically. The price for one watt of photovoltaic panels has fallen from $76.67 in 1977 to as low as $0.50 in 2013. Other items such as inverters and wiring make the rest of the so called hard costs of going solar, which according to the National Renewable Energy laboratory, come to a total of $1.76 per watt. 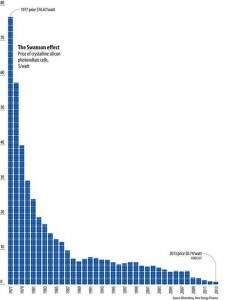 The rest of the average $5.00/watt that residential customers in the U.S pay for solar comes from “soft costs”. While hard costs have been consistently falling, soft costs have not undergone such a radically change. In fact, soft costs now make up over 64% of the total price for a residential solar system. Rebates programs in some areas help to offset these soft costs and to make solar affordable enough for the average home owner, but that isn’t a sustainable model. Controlling these soft costs is key to creating a competitive and thriving solar market in the United States. 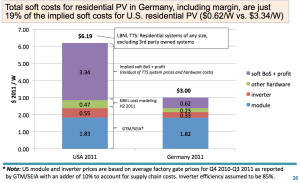 Solar is already cheaper in places like Germany, where the average total cost per watt is as low as $2.56. An average U.S system costs nearly twice as much, even though hardware costs are the same in both countries. So what are the areas that the U.S solar industry can improve upon? The largest solar soft costs in the U.S come from supply chain management, both physical and financial. Supply chain issues represent 11.7% of the total cost of solar, or about $0.61/watt. Transportation and storage costs in the U.S tend to be higher than in Germany. This has a lot to do with the fact that the U.S is a large country with a fairly spread out population, compared to Germany. Solar companies often cover large geographic markets, which requires them to ship their hardware across equally long distances.